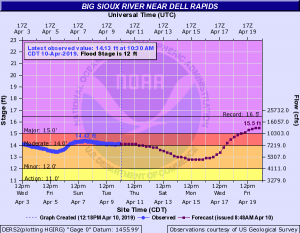 Peak Flood Waters Reached in Dell Rapids? The Big Sioux River in Dell Rapids may have seen the highest levels of flood waters. 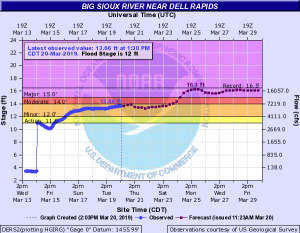 According to the National Weather Service’s Advanced Hydrologic Prediction Service website, the peak of the flood waters of the Big Sioux River in Dell Rapids may have happened on Sunday, March 24th. The river reached a recorded height of 15.98 feet on that day. About 25 properties have been impacted by the flood waters by the river according to City Administrator Justin Weiland in a report he gave to KELO TV. The community has come together over the last couple of weeks putting together sandbags, helping place those sandbags, and help property owners move possessions in hopes of minimizing the damage from the flood. The question now is how long the flood waters will remain at the current level. The National Weather Service’s prediction shows the river should remain at about 15.8 feet throughout the remainder of the week. Flood waters should start to recede about Monday, April 1st with the water level dropping to just over 12 feet by Friday, April 5th. Outlooks could change, though, with more snow that has yet to melt in northern South Dakota. 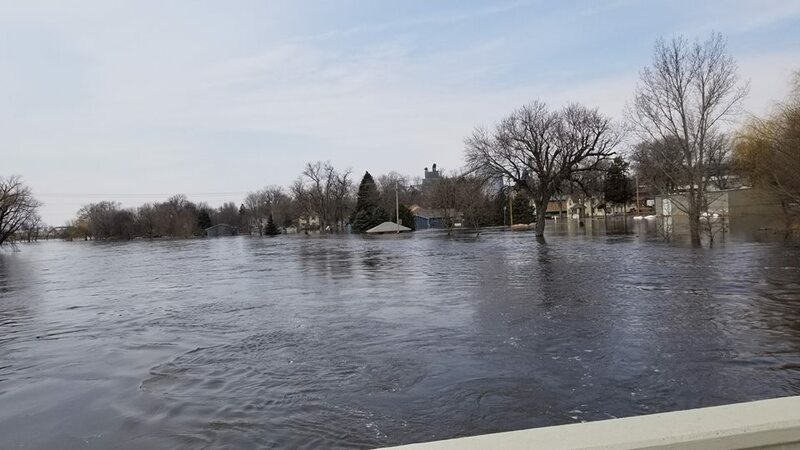 According to Jason Gearman of the Minnehaha County Emergency Management the weather forecast has really helped keep the levels below what was predicted for the flooding weeks ago. With the flood waters predicted to stay in the “major flood” stage for another week, it will still take some time to survey all the damage caused by the flood. You can monitor the National Weather Service’s water level predictions for the Big Sioux River by clicking this link. 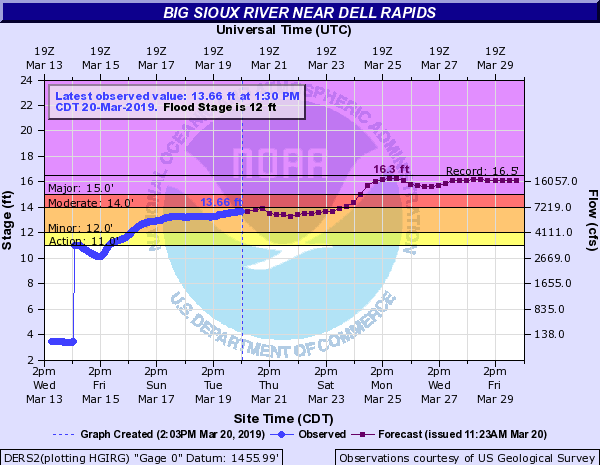 The National Weather Service is predicting the Big Sioux River in Dell Rapids will reach near record flood levels by Monday, March 25th and stay near that level throughout much of next week, and citizens are proactively working to limit the damage as much as possible. 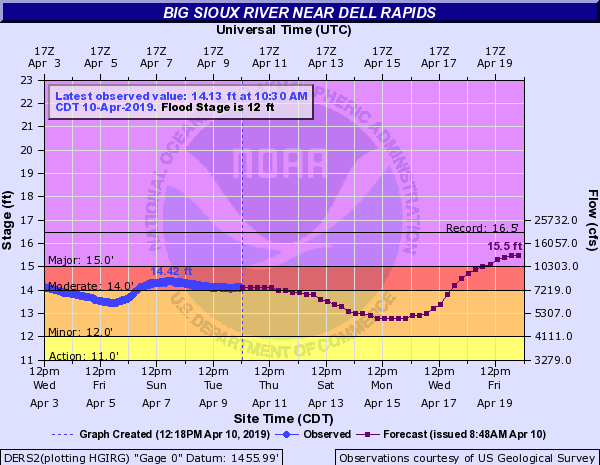 The NWS predicts the Big Sioux River will hit 16.3 feet, which is just shy of the 16.5 foot recorded record. Flood stage is at 12.0 feet. The current level of the river is at 13.66 feet. 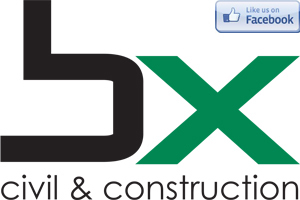 The City of Dell Rapids has been in coordination with the Emergency Management staff at Minnehaha County. A 24-hour sandbagging site is now open at the Dell Rapids City maintenance shop located at 24680 475th Ave. Sandbags, shovel, and sand is available at the site and will be open 24 hours per day, seven days a week. Residents are urged to be prepared to fill their own sandbags, however, there are efforts to get volunteers to help fill the bags.